Genuine Datacard 534000-007 YMCKTK color ribbon kit. Datacard recommends using authentic Datacard supplies to ensure the best performance from your ID card printer. Replaces the discontinued Datacard 552854-520 ribbon kit. Datacard 534000-007 YMCKTK ribbons are used for printing a combination of full-color images and one-color text or barcodes, and feature an Earth-friendly biodegradable core. 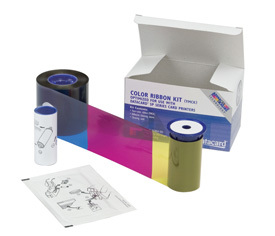 YMCKTK ribbons consist of yellow (Y), magenta (M) and cyan (C) panels for printing a full spectrum of colors by combining the colors using varying degrees of heat. The two K panels are black resin, typically used for printing text and barcodes and the T panel is a thin, clear protective overlay. The Datacard 534000-007 ribbons are used for dual-sided printing, with YMC, the first K panel and the T panel for printing on the front side, the second K panel prints on the back side of the card. The Datacard 534000-007 replaces the Datacard 552854-520 ribbon.